Click here to watch the complete sorting video. Different products and different order profiles require different sorting techniques. The size, weight and shape of the product all affect which type of sorter should be chosen. Mechanical sorter systems by reputable OEM suppliers, integrated by Inther, stand out in terms of speed, capacity and reliability. We have successfully implemented sorter systems for a wide variety of areas, including fashion, non-food products, jewelry, etc. 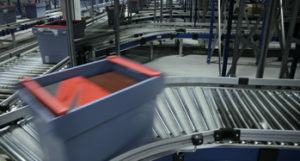 Based on years of practical experience we help our clients to select the right sorting techniques for them. The aim is to find the right balance between daily workload, equipment dimensioning, business goals and budget constraints. Solutions vary from semi-automatic Put to Light-supported distribution to fully mechanized sorting by means of a pusher sorter, shoe sorter, cross-belt sorter, tilt-tray sorter or split-tray sorter. 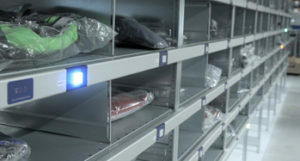 At Inther, we supply sorter solutions with a modular set-up facilitating easy expansion in the future. The various sorting techniques can be deployed independently of each other, but it is more commonly to combine different building blocks to create a total solution, e.g. mechanized sorting as the first step, followed by Put to Light for finely meshed distribution (i.e. e-commerce). Our Inther LC software suite forms the backbone of our solutions, supporting a wide range of sorting concepts. This software includes various algorithms, enabling us to devise the optimal solution for every customer-specific situation. The Inther LC software suite also supports the optimal integration of the sorter into a larger material handling system. By truly integrating the various systems and order picking areas in your warehouse, we give you real-time insights into your warehouse workflows.